That unexpected bolt of inspiration can strike anytime, anywhere. It could be the sight of a colorful flower, a folded jacket left on a chair, the movement of an orchestra conductor’s baton, or an arrangement of umbrellas on a beach. With sketchbook in hand, excitement races to your fingertips. Of course, anxiety can flow as well. 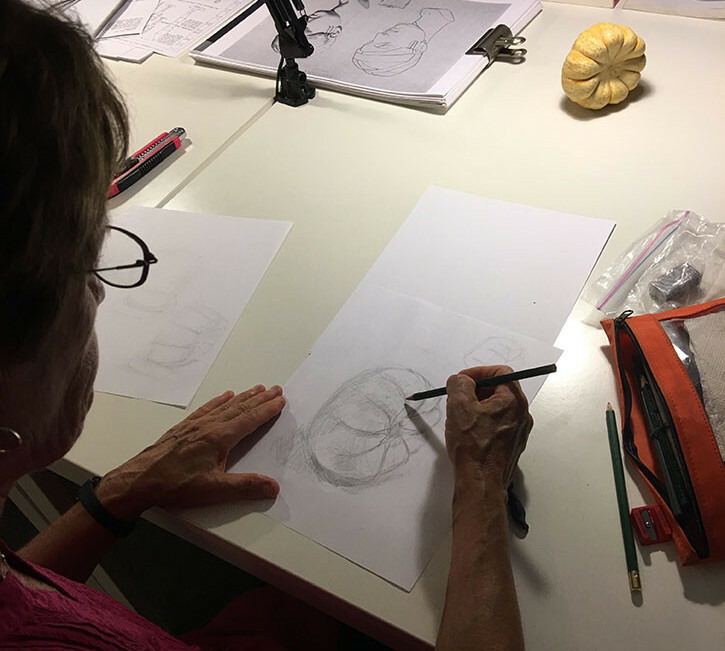 Your confidence may be off the mark, especially when you are drawing a subject for the first time. But your desire to draw is too strong. The fear of a challenge becomes thrill of the hunt—the capture of an elusive, fleeting glimpse. I walked to a rehearsal for the Cabrillo Music Festival at the Civic Center last week during my lunch break. 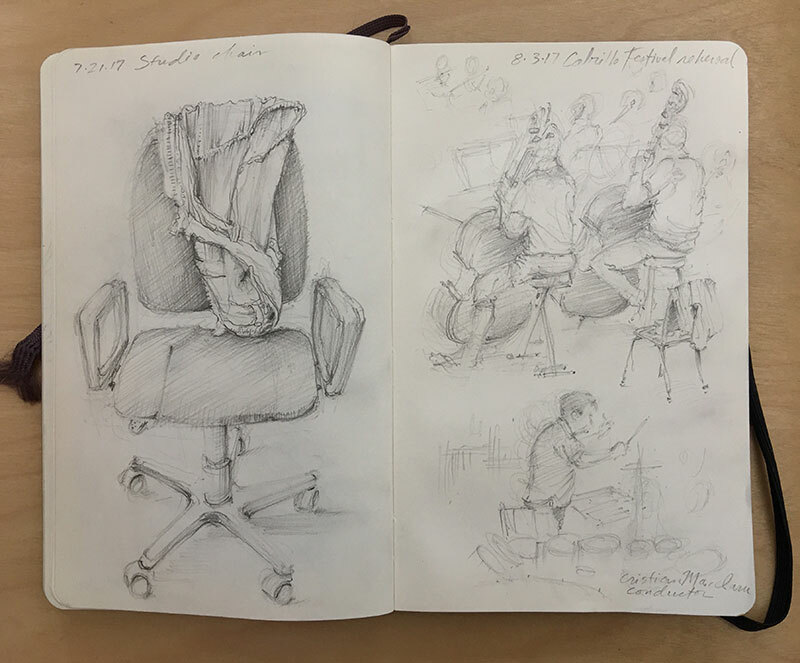 Next to a studio chair I sketched awhile back is my take on the string section of the orchestra and the movement of conductor Cristian Macelaru’s baton. I didn’t notice until afterward that a chair with a jacket left on it became a subject in both sketches. Interesting how the sketching process works. It is a rewarding habit to carry a sketchbook with you. Having the courage to use it can reap endless, gratifying rewards. Go ahead, step out of your comfort zone. Every sketch you do, even a two-minute scribble, is an investment towards strengthening your skills, improving your technique, or simply enjoying a precious slice of solitude. 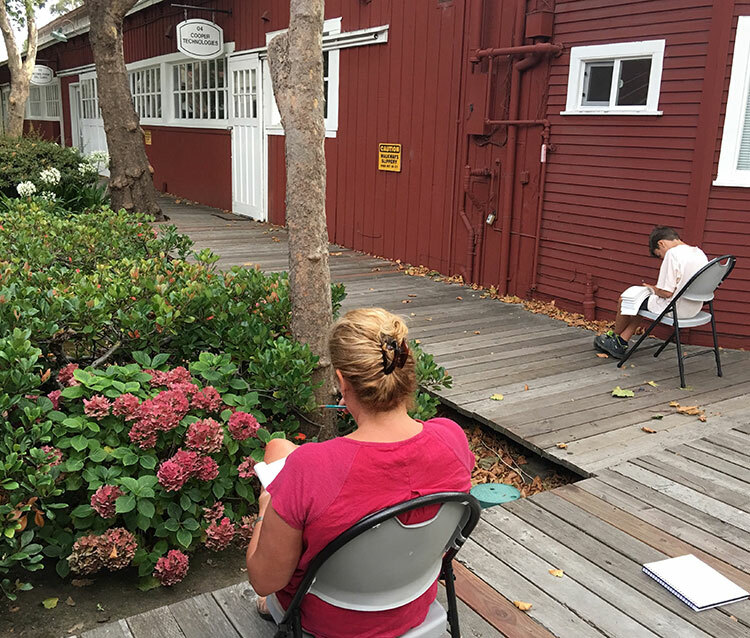 On Thursday, Becky and Devin continued their sketchy adventures deep in the drawing jungle outside our studio. Captures by mom and son after an evening sketch safari. 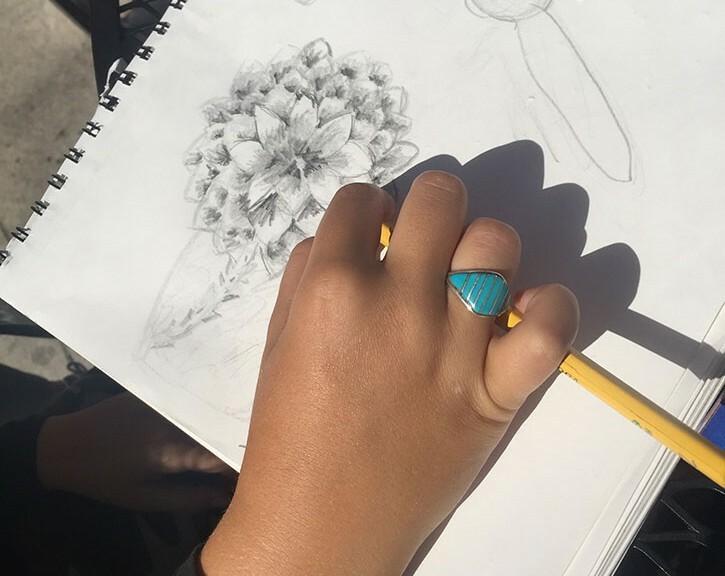 Becky shows depth in her sketch by emphasizing lines and shading behind flowers and leaves. 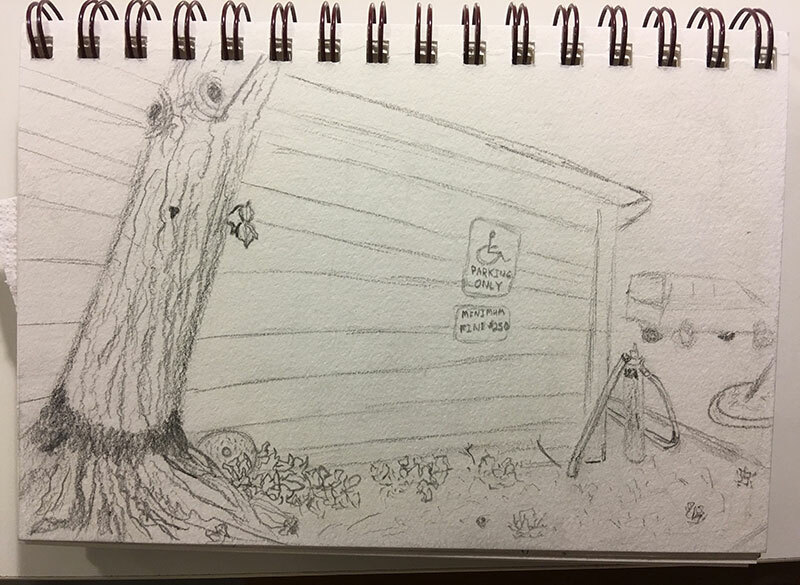 To show depth in his drawing, Devin practiced 1-point perspective and emphasizing the textures of a tree and details of pipes in the foreground. He also made things lighter as they receded toward the door in the distant background. Adult student, Mike was vacationing at Lake Tahoe during last week’s hot weather. 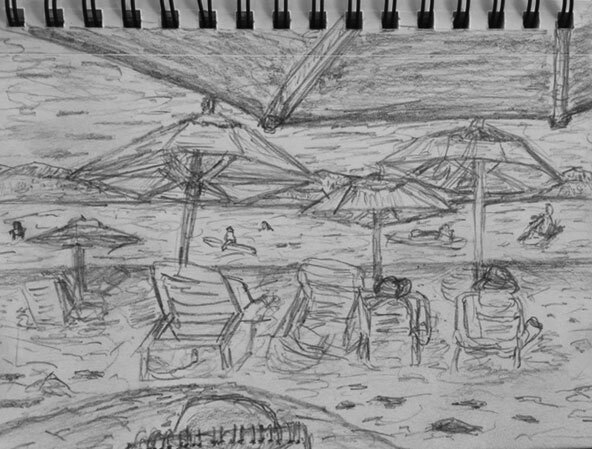 Lots going on in this wonderful sketch he did while relaxing in the shade under an umbrella. And then the rain came! It chased everyone away and cooled things off. Great before and after umbrella studies. 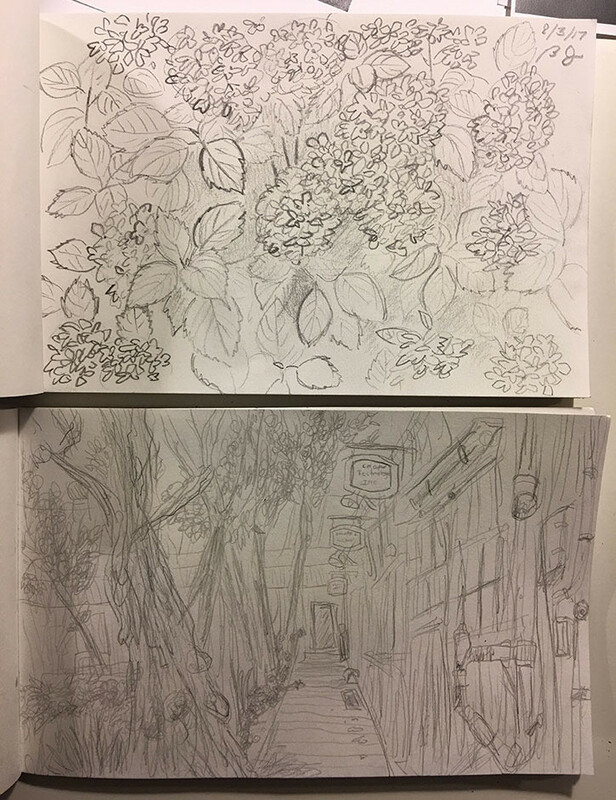 Draw With Your Kids student, Zak, once again ventured outside the studio to capture the subtleties of angled perspective lines. I really like how she emphasized the textures of the tree and leaves on the ground to create depth in her composition. Your sketchbook is your own little place to practice and experiment. Sometimes sketches flow effortlessly, and sometimes it is a struggle to capture a likeness of your subject. But it is a gratifying feeling when you finish an honest effort on a page, close your sketchbook, and ponder your next challenge. Aren’t you glad you have your sketchbook with you? 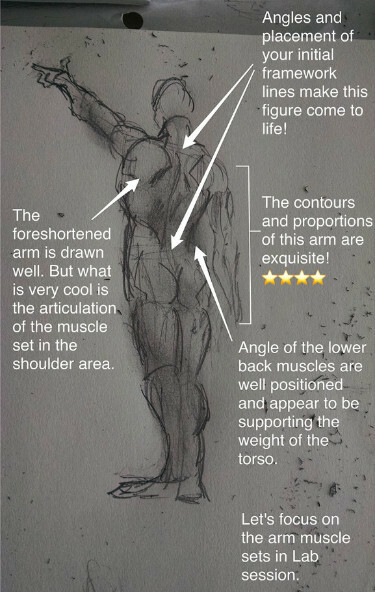 Casey’s fantastic study of the muscle structure of a figure. 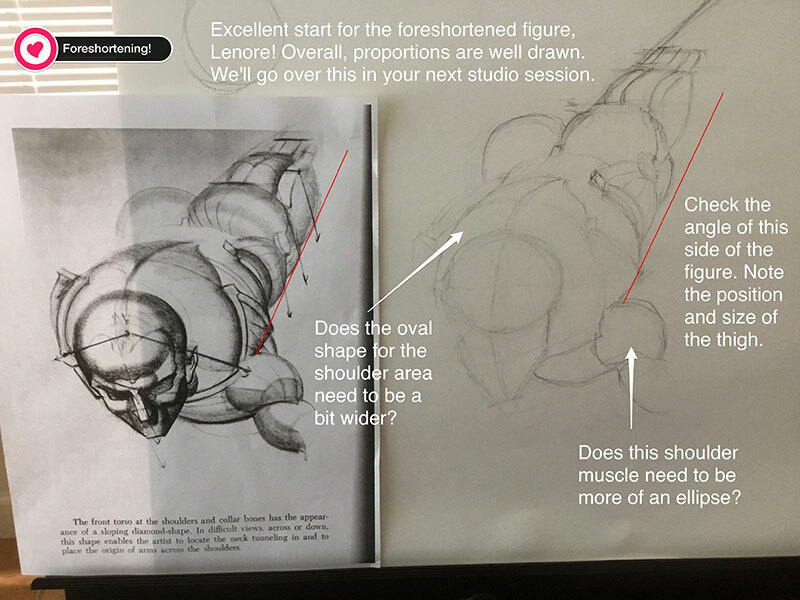 Lenore grabbed this intricate study from Burn Hogarth’s Dynamic Anatomy before doing a finished version in Wednesday’s Drawing Lab. 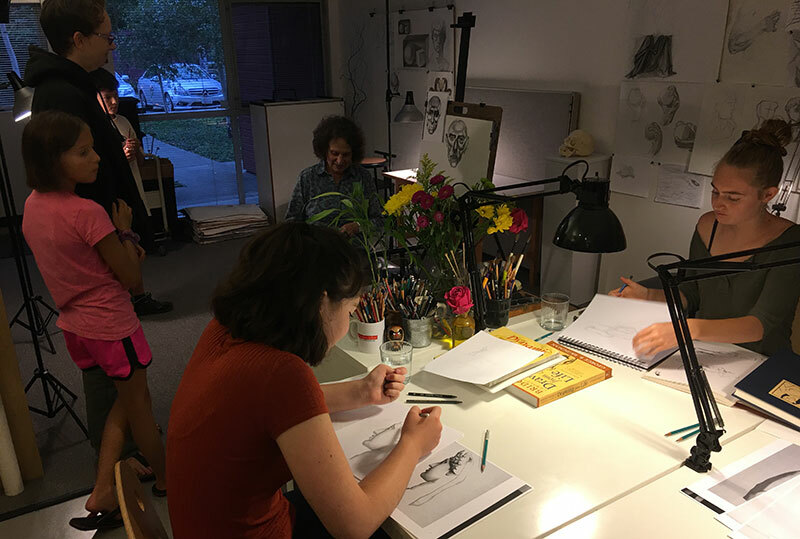 Thursday’s Drawing Lab sketchers wrapping up another evening of drawing. 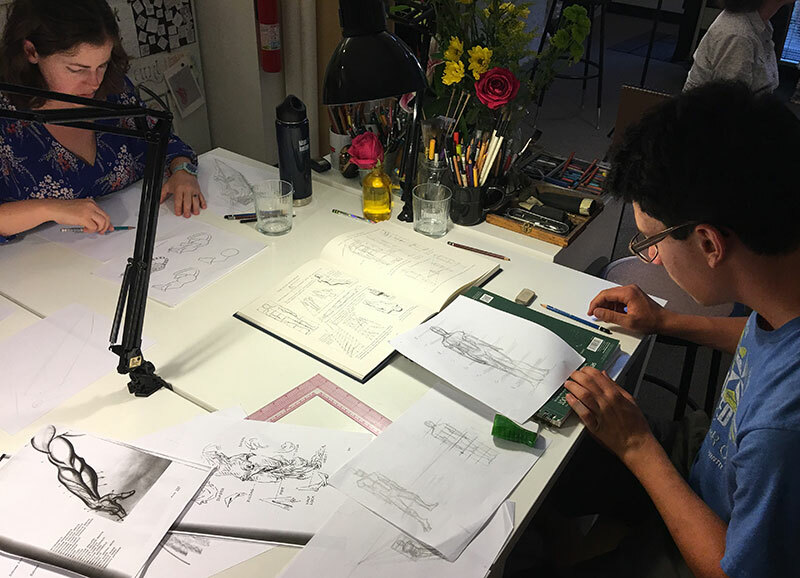 Helen is welcomed to our Drawing Lab crew by Casey as she sailed through her first lessons—she has a jaguar captured on the table! Tina got squashed on Wednesday as she moved to Level 2 studying contour lines and form! At 7-years-old, Naomi is our youngest youth sketcher. 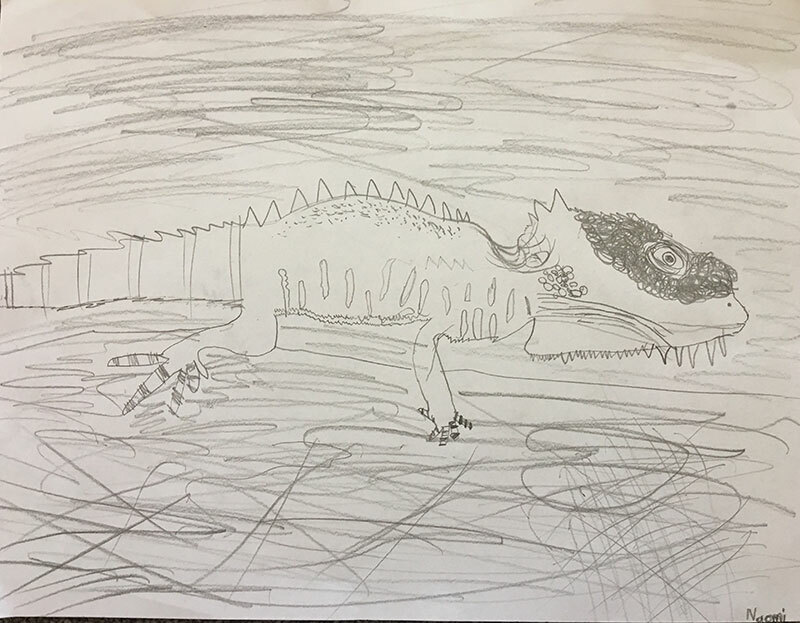 She drew this highly detailed, Level 2 lizard from a reference photo while learning about contours, textures, and proportions. 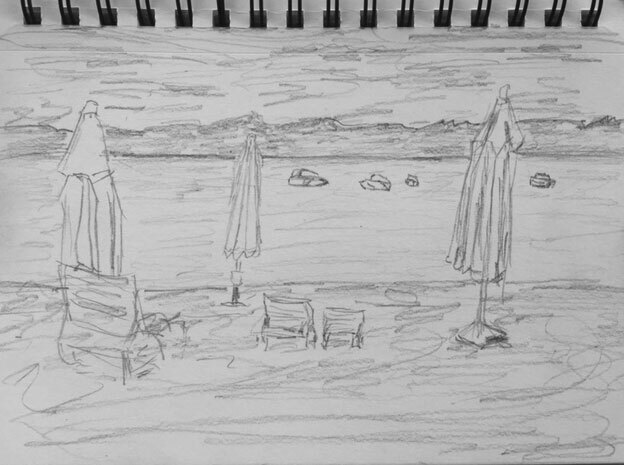 Youth sketcher, Max, moved to Arizona this week. 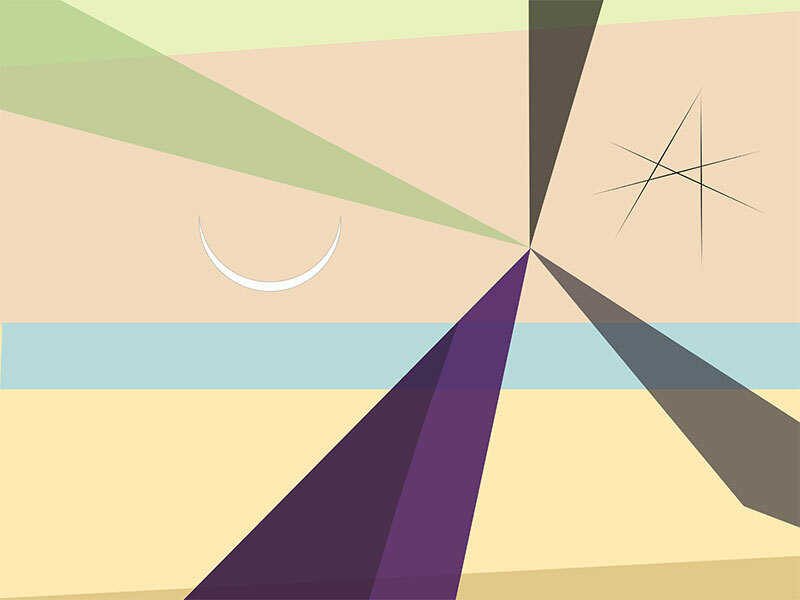 But she is continuing with mobile coaching as we work on observational drawing and amazing abstract-surreal compositions on her iPad, like the one above.